Thousands protested yet again in Egypt to support deposed President Mohammed Morsi, a day before the Muslim Brotherhood faced an unprecedented wave of trials and a car bomb exploded near an Egyptian army intelligence building, wounding six. The prosecutions are part of an ongoing crackdown on the Brotherhood, following Morsi's ouster in July. At least nine cases, with multiple defendants, are in the process of being formed; Four of them — including Morsi's — have being referred to trial already. The former President, who is accused of inciting the violence that left 10 dead last December, is set to begin his trial on Nov. 4, along with 14 co-defendants, also from the Brotherhood. His charge could carry the death penalty. In total, around 2,000 Brotherhood officials have been detained, with another 6,000 being questioned for information that could be used against the leaders. According to a human rights lawyer, an estimated 200 Brotherhood members will probably end up in court. 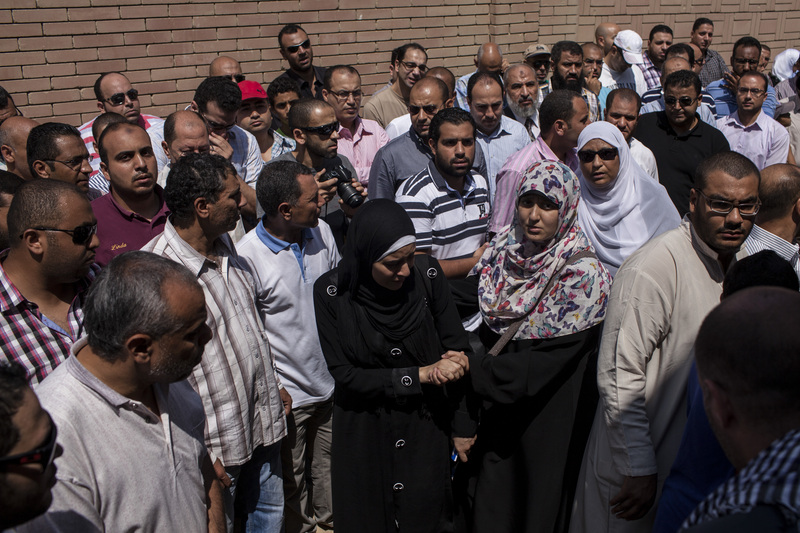 "They want revenge," said a rights lawyer with the Hesham Mubarak Legal Center, referring to the current government. "The rights of not only the Brotherhood, but many other Egyptians, will be lost because of arbitrary procedures." Already, the retrial of 85-year-old Hosni Mubarak (Morsi's also-ousted predecessor) is currently under way, as top security officials, including former intelligence chief Murad Muwafi, took the stand in court on Saturday. The deposed dictator faces charges connected to the deaths of roughly 900 protesters during the 2011 revolts that led to his ousting. Since the July 3 removal of Morsi, the army-backed government has been cracking down on the Muslim Brotherhood, making the party illegal, jailing its members, and now focusing increasingly on its mosques and charitable organizations. "All of these charities that are either controlled by members of the Muslim Brotherhood or affiliated loosely with the Muslim Brotherhood are now seen as a potential space for organizing politically by the authorities," says the Egypt director for Human Rights Watch. "I think that's why they want to go after them and control them." On Friday, a pro-Morsi coalition organized protests in support of the ousted President and the Muslim Brotherhood. Thousands marched across the country denouncing army general Abdel Fattah al-Sisi, who instigated the July 3 ouster. Five were injured in resulting clashes; four in the Nile Delta city of Zagazig and one just south of the capital in Fayoum. However, the coalition — which had previously been adamant in calling the interim government completely illegitimate — also released a statement saying it might agree to having mediators work on solving Egypt's current political impasse. Meanwhile, a car bomb blew up in the Egyptian city of Ismailiya Saturday, injuring six soldiers and destroying a military intelligence building. Although a second car explosive was found in the area, experts were able to dismantle it before it was detonated. No group has, as of yet, claimed responsibility for the attack.